As I have attempted to demonstrate in previous posts, the Columbia River Gorge is a pretty awesome place to play in the outdoors. Today I took a tour of the Washington side with my wife and our faithful pup. We began at the lower end of the Cape Horn area, where we walked through fern and moss draped trees to eyeball a beautiful cascade right below the rock and mortar protected outlook. Good start. After meandering past further road views from the Cape Horn area, we stopped at the St. Cloud recreational site, a pleasant surprise set in an old orchard on the bank of the Columbia River. We walked through the orchard and down to the water for some close up views of the famous river. Such views! As we left, Jackie trotted by a great old log that seemed to me to have a leonine face on its end. Soon, we drove by the famous Beacon Rock but didn’t dally long, then paused briefly at an historic marker pullout which referred to the Lewis and Clark expedition coming through the area. A landslide 500 years ago came down from the area near Table Mountain and dumped debris in the river here. The spot also offered a unique view of Cascade Locks, where Cheryl Strayed ended her PCT hike (shameless attempt for search hits), and I was disappointed to learn that Char Burger is no more. When we left Stevenson I briefly contemplated a hike up Wind Mountain, but thought better of it. Too chilly. Go east, (not so) young man! Coyote Wall was calling me. So we headed to the area popular with mountain bikers and hikers alike. The start may have been the best part in more ways than one. The old road was easy walking, and within five minutes saw two bald eagles relaxing on a snag. It was the best view I’ve ever had of an eagle. Once we ventured off the road onto a rocky muddy trail, the landscape changed a lot. 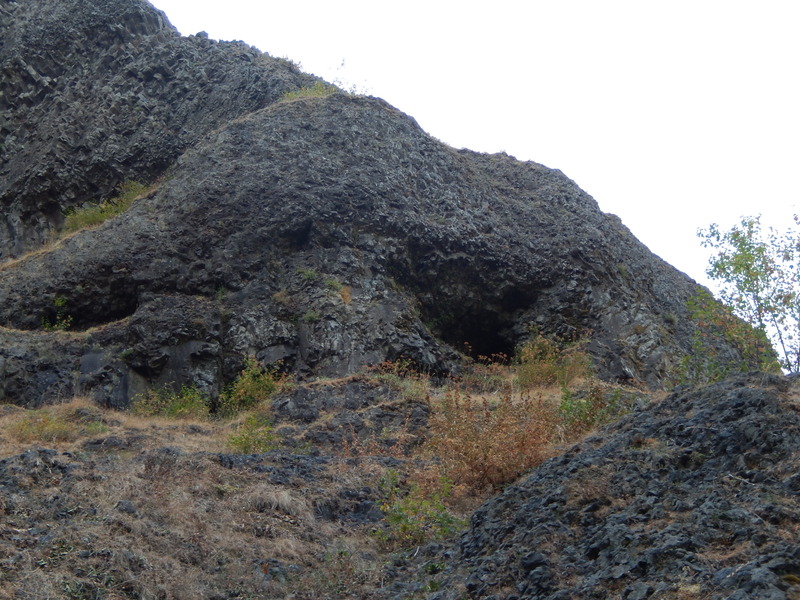 The hills undulate, and there are cool rock formations. I was slightly surprised that the area was quite green, but it is January. The temperature plunged as cloud cover came in, and we decided to turn back, since we still had a long drive home. It was a great day of walking and sightseeing with the fam. The Columbia Gorge seems to have enough gorgeous waterfalls to satisfy any aquaphile. I keep finding new ones, and this week was no exception as I visited two new falls for me, including one not too many folks approach: Mist Falls. It’s not far from the tourist destination of Multnomah Falls, and it’s one of the highest falls in Oregon, yet there is no official trail climbing there. 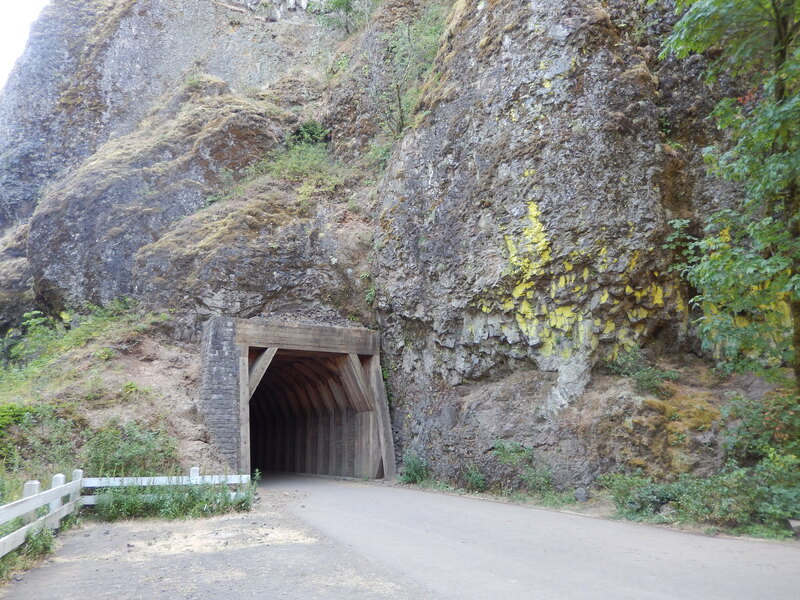 The trailhead is little more than a short pullout just west of Wahkeena Falls. A minute up the trail, where it still feels like a trail, one comes to the brink of a creek. Across the creek is a stone chimney, the last remnant of the aged Multnomah Lodge. After turning a corner, the first open view of the falls. That’s the trail? Steeper than it looks, too. From there, what passes for a trail is really more of what I would call a talus thrash. The slope is steep and the footing is anything but solid. It would have been a good place for trekking poles, but knowing it was relatively short, I wasn’t worried. IN fact, in less than ten minutes, I came around a moss encrusted rocky shoulder and got my first glimpse of the falls. There has been very little precipitation in Western Oregon for a coupe months, so I was hardly surprised to see the falls looking rather thin. The water drops in two stages, the first a long dramatic and misty airborne plunge from a cliff, the second a lower angled cascade in the center of a broad rocky bowl. I scrabbled up a steep shoulder on the left side of the falls where I was able to look back and see a bit of the Gorge but not as much as I’d hoped. 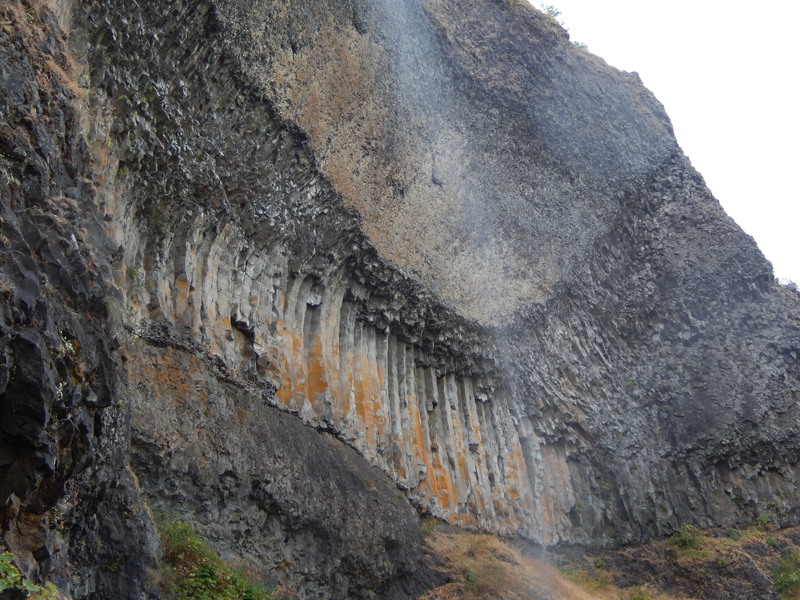 The depth of the falls was clearly visible here, as were some of the geologic layers, columnar basalt wedged between more chaotic forms of erstwhile lava. The bowl itself was dramatic and looked ripe for exploration with the right equipment. A dark inset to the right of the falls was particularly intriguing to me, but the rock was steep enough that I didn’t want to venture up there solo without more preparation. If it’s a cave with Neolithic paintings or pottery fragments, their discovery will have to wait for another day. The hike up to Mist Falls was short but challenging, and the little amphitheater was well worth exploring. This is good adventurous trek to appease adrenaline junkies bored by casual looks at roadside falls. While not for inexperienced hikers, mountain goats would surely love this hike. Here is a simple plug for a spot to hike and picnic if you are near the District of Columbia. 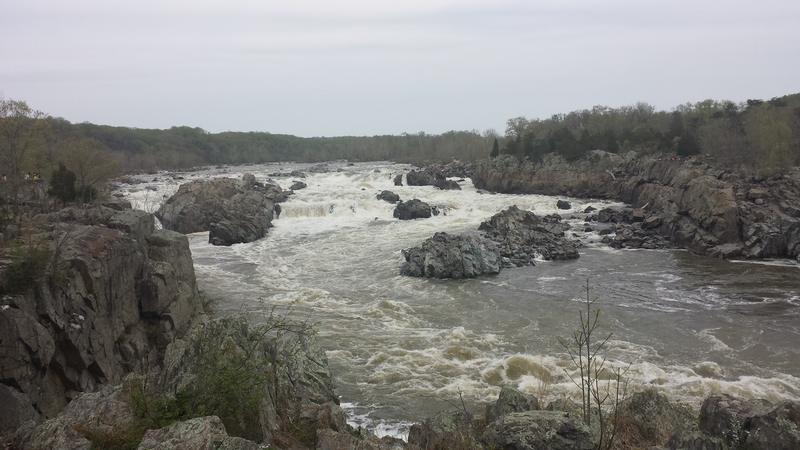 The Potomac River splits Virginia and Maryland, and a great falls crashes along for hundreds of yards. When I visited there with my family recently, I also saw kayakers playing in the froth, and climbers scaling the taller riverside crags. Do not expect much solitude, but visit expecting a unique spot close to the nation’s capitol. After working 18 days straight thanks to pressures associated with the upcoming holiday, I finally got a day off today. I helped my broken-footed wife get set for the day in her arts shop, then took my faithful canine pal, Jackie Chan, to the Columbia Gorge for a stroll in the forest. It was chilly and cloudy, so I decided the famed Eagle Creek trail wouldn’t be too overcrowded. Normally I avoid popular trails, but there’s a reason this trail is so well known in in the area. It’s easy, and it’s beautiful. The round trip to High Bridge is a casual afternoon at 6.5 miles. There were plenty of people on the trail, but it never felt crowded. I hadn’t been here in a couple decades, and I was pleasantly surprised to find new spectacular features unfolding the entire way. By the time Jackie and I returned to the trailhead, I knew I would not wait two decades for another hike up Eagle Creek.